Fall in the Smoky Mountains is one of our favorite times of the year. Not only is this when the weather starts to cool off, but it is also when the leaves in the trees turn from lush greens to brilliant shades of red, yellow, and orange. It is a natural beauty you have to see to believe. That is why we have put together a list of all of our favorite places to take the best photos of fall colors in the Smokies, so you and your family or group can experience these views and have something to remember your experience by for years to come. By far, our favorite place to take photos of fall colors in the Smokies is from the comfort of the private back deck of a relaxing Smoky Mountain cabin rental. These rentals give you and your loved ones panoramic views of the majestic mountains in the distance, as well as a peaceful place to retreat to after a fun-filled day or exploring. Whether you are snapping pictures of the leaves in the trees or posing with your loved ones for a candid shot to commemorate your trip, we promise you will not be disappointed with the picturesque views you find here. The best part is when you are done, you can put the camera away for a little while and have fun and relax with your loved ones, including unwinding in the outdoor hot tub or spending time relaxing in the outdoor rocking chairs as you continue to appreciate the views. 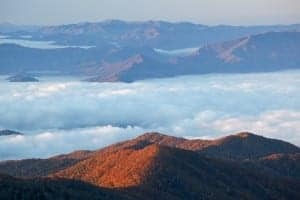 The Newfound Gap Overlook is a great place for you and your family or group to snap a few photos of the scenic Smoky Mountains, especially during the fall. In addition to giving you a breathtaking mountain view for as far as the eye can see, there are also several fun and unique spots you can pose next to capture fond memories of your vacation, including the Tennessee/North Carolina State Line sign and the Franklin D. Roosevelt Memorial. For even more scenic views, you can continue your drive down the Newfound Gap Road towards Cherokee, NC. Along the way, you will find several more scenic pull-offs and mountain views to continue your photo adventure. If you have a little bit of extra time in your travel itinerary, we recommend you take a trip to Clingmans Dome. Located just 15 minutes from the scenic overlook, Clingmans Dome is the best place to go if you want to experience a full 360-degree view of the fall colors in the Smokies. On a clear day, the view from here can stretch up to 100 miles into the distance. This means, you will not only get to appreciate the mountain views around you, but you will also catch a glimpse of Gatlinburg miles away. To get to the scenic overlook at Clingmans Dome, all you have to do is park your car in the parking lot and hike up the half-mile trail. Please keep in mind, the elevation gain here is quite steep, so you will want to wear comfortable clothes and possibly pack a bottle of water. We love Cades Cove for taking pictures of the fall colors in the Smokies because it is the perfect place to go if you want to combine beautiful scenic views with a touch of history. Not only is this area surrounded by a ring of gorgeous mountains, there are also a variety of historic homesites and old buildings found here that will give you a glimpse of what life was live for the early settlers. Not to mention, there are also a ton of fun and challenging hiking trails that begin here you and your family or group can take if you want to continue your journey for picturesque scenic spots during your vacation. There is also a relaxing picnic area where you can enjoy a delicious meal outdoors as you take in the beautiful views with your loved ones. There are two reasons we love the Ober Gatlinburg Aerial Tramway as a place to take photos of the fall colors in the Smokies. For starters, it gives you a unique view because you can travel over the top of the trees. Therefore, allowing you to experience a new site of the fall colors you may not be able to see otherwise. The second reason we recommend the tramway is because of the fun and exciting experience it provides. No other place on our list invites you enjoy a scenic tour of the natural beauty of the area as you are transported from the parkway in downtown Gatlinburg to the Ober Gatlinburg Ski Resort. Now that you know where to take all of the best photos of the fall colors in the Smokies, it is time to start planning your next trip to the area today! You can start by selecting which of our relaxing Smoky Mountain cabin rentals with a mountain view you and your family want to stay in.